Call us to schedule any of our programs for a minimum of 12 Scouts or a maximum of 20 Scouts on a date that works for you! Create a tall tale with your den, then make up your own stories to share. Scouts will learn about the story of Johnny Appleseed and make a related craft to take home. This program also includes games from the past, old-fashioned toys, a sing-along of popular folk songs, and a tour of Naper Settlement’s Log House. Program is 1.5 hours long. Develop mapping skills in a variety of ways, including creating a map, finding your place on a map, and studying a map of the world. Scouts will also learn to identify a compass rose and determine directions using a compass. 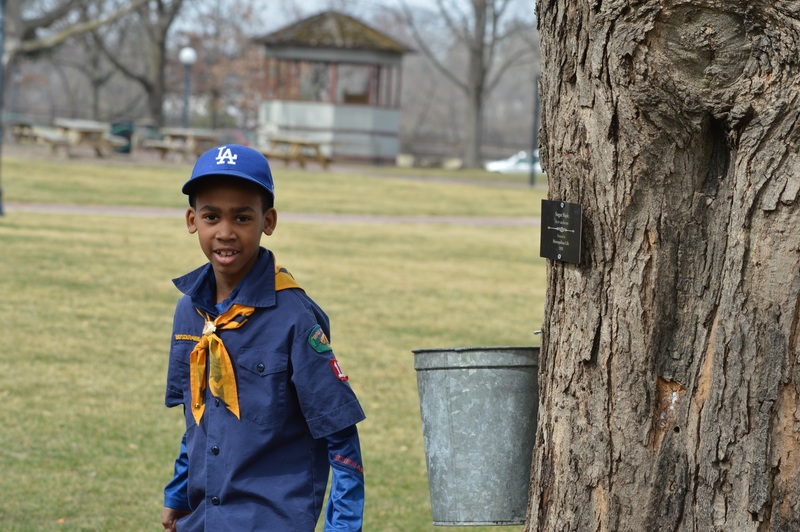 With their new skills, Scouts will complete a scavenger hunt around Naper Settlement. Program is 1.5 hours long. Get to know one of history’s most popular games—marbles! Scouts will learn the history of marbles and how to play, including fun slang phrases. Scouts can also race their marbles and create a marble maze to take home. Each Scout will assemble their own marble set to use at their next den meeting. Program is 1.5 hours long. Explore Naper Settlement’s grounds like never before! Go on an outdoor treasure hunt using a global positioning system (GPS). Between the GPS unit and a lesson on coordinates, Scouts will be able to scour the museum grounds for hidden caches. Program is 1.5 hours long.